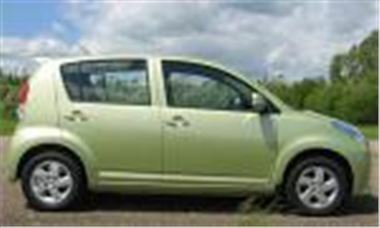 Perodua has extended its £1,000 cashback, keeping the price of its Daihatsu Sirion based MVYI 1.3 SXi to just £6,799 and the 4-speed auto to £7,499 to 30th June 2007. Yaris sized car based on Daihatsu Sirion. Chain cam Toyota Derived engines. 1.0 litre Toyota 58bhp three cylinder (in home market) and 1.3 litre 87bhp four cylinder engines. 3,720mm long x 1,665mm wide x 1,550mm high. EXCELLENT VALUE FOR MONEY, ESPECIALLY WITH £1,000 CASHBACK. Decent drive. 60/40 split rear seats fold flat.